If you are in the market for a new .45 caliber pistol, you’ve come to the right place. The .45 ACP round is one of the most popular centerfire pistol rounds in existence. As a result, there are an extremely wide variety of pistols chambered for the cartridge. Now when you think about the term “.45 ACP pistol”, the first gun that comes to mind is probably a 1911, and understandably so. There’s no denying that the 1911 is a great gun. But at the same time, it’s hardly the only choice for a .45, and far more modern and arguably superior options are available, as we will soon see. In this article, we will talk about the top 5 best .45 ACP pistols that are not 1911s. But before we get into that, let’s cover the pros and cons of the .45 ACP pistols to begin with. There are many advantages to the .45 ACP round over other options such as the 9mm Luger and the .40 S&W. At the same time, there are a number of negatives as well, so we’re going to give a fair perspective of the .45 round by discussing its pros and cons. First and foremost, let’s get some facts out of the way. 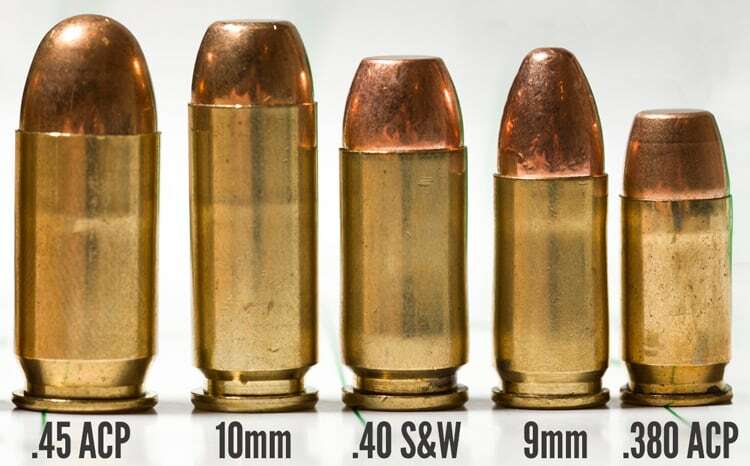 The .45 ACP round typically is a 230 grain bullet with an average muzzle velocity of 830 feet per second when fired out of a pistol with a 5 inch barrel. It’s been well known as an effective man stopper, including in the original full metal jacket (FMJ) round and not just when loaded with jacketed hollow point (JHP) rounds. This is a major plus for self-defense scenarios. The .45 ACP has a reputation for being a powerful round, and as a result of that many people fear shooting it, especially those who have limited experience with guns. They believe that it will have uncontrollable recoil, similar to a .44 Magnum or even larger round. But in reality, the .45 round is actually much more controllable than many people realize. This is at least true when the round is fired out of a larger sized handgun; compact and lighter models are definitely more difficult to shoot effectively. For example, the 1911 has a much more soft and reduced recoil in contrast to what many people realize. Other full size .45 pistols, like the Walther PPQ 45 or the HK USP 45, also have a softer recoil than you may anticipate. But when you get down into the smaller and more compact offerings, such as the Springfield XD-S in .45 ACP, you are definitely going to notice a much more pronounced and snappier recoil. For this reason, a larger sized handgun that is more controllable will be a far more suitable choice for self-defense. Another pro to the .45 is that it is very easy to find. In fact, the only other centerfire handgun round that is probably easier to find is the 9mm Luger. If you walk into any firearms or sporting goods store, you will most certainly find .45 ACP ammunition, and you will likely find a wide variety of it as well. One disadvantage to the .45 is that it is more expensive in contrast to the 9mm. Whereas a box of 50 FMJ 9mm rounds will cost around $10, a box of 50 FMJ .45 rounds could potentially cost you anywhere from $15 to $20. This expense is an issue if your budget is limited and you want to get lots of training in. If you have money to spare, then don’t let this discourage you from purchasing a .45 pistol. But if you are on a budget, you’ll definitely want to look for cheaper calibers such as the 9mm Luger. Another disadvantage to the .45 is magazine capacity. Most .45 pistols have a lesser magazine capacity than the 9mm or .40 S&W because it’s a larger round. This makes the .45 a less attractive option if you want or need to defense yourself against multiple attackers. Granted, some .45 pistols do have sufficient ammunition in the magazine. The FNX-45, for example, holds 15 rounds in the magazine even though this is rare for .45 pistols. But other offerings such as the HK USP or the Walther PPQ 45 hold 12 rounds in the magazine, and the Springfield XDM 45 holds 13 rounds. All in all, the .45 round is still a great round. There’s a reason it’s been around for over one hundred years, and will likely be around for another hundred at least. 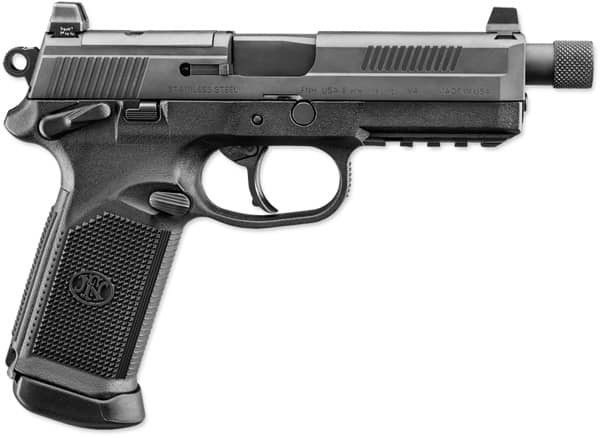 The FN FNX is a polymer framed, hammer fired pistol manufactured by FN America in South Carolina. In addition to .45 ACP, it is also chambered for the 9mm Luger and .40 S&W rounds. The FNX-45 comes standard with a safety and decocking lever, Picatinny trail, loaded chamber indicator on the right side of the gun, two interchangeable back straps, a plastic hard case, three extra magazines out of the box, tritium night sights. But the FNX Tactical version also sports even more advantages, including tritium night sights that are suppressor height, a threaded barrel, and a milled sight that makes it easy to install a red dot sight. One of the biggest advantages to the FNX-45 in general, regardless of whether you buy the Tactical version or not, is the fact that it carries 15 rounds of .45 ACP ammunition in the magazine. This is very impressive, because most other .45 pistols don’t even compare with that kind of capacity. The 1911 holds 7-8 rounds depending on the magazine, the SIG Sauer P227 holds 10 rounds, and the HK USP holds 12 rounds. In fact, 15 rounds in the magazine is something that is far more common with 9mm and .40 pistols, so this is definitely a big push towards the FNX-45 as a defensive pistol. The Walther PPQ, or Police Pistol Quick Defense, is a development of the Walther P99 pistol. Whereas the P99 is a DA/SA semi-automatic pistol, the PPQ is a single action only pistol like the Glock. The PPQ is currently available in four calibers: .22 LR, 9mm Luger, .40 S&W, and .45 ACP. The .45 ACP variant is a larger size than the other offerings. Whereas the PPQ 9mm and .40 are mid-sized pistols like the Glock 19, the PPQ 45 is definitely a full size model. The big selling point of the PPQ 45 is its excellent ergonomics and incredibly smooth and light trigger pull. In fact, the trigger of the PPQ pistol in general is well known for being one of the lightest and smoothest of any striker fired pistol on the market today. 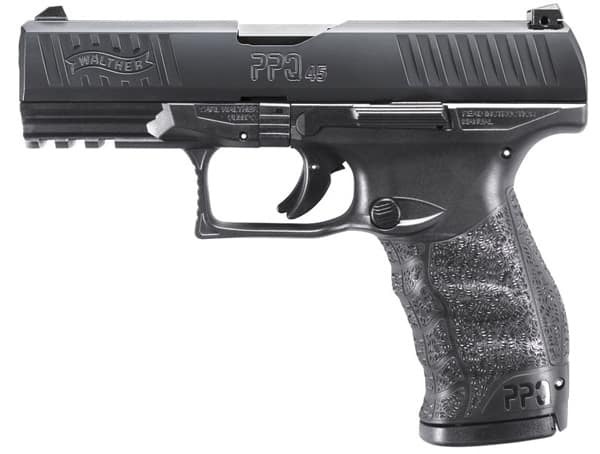 The ergonomics of the PPQ are very natural, which is something that Walther in general has become very well known for. You’ll just have to hold a PPQ in your hand to see (or more appropriately, feel) the excellent ergonomics for yourself. 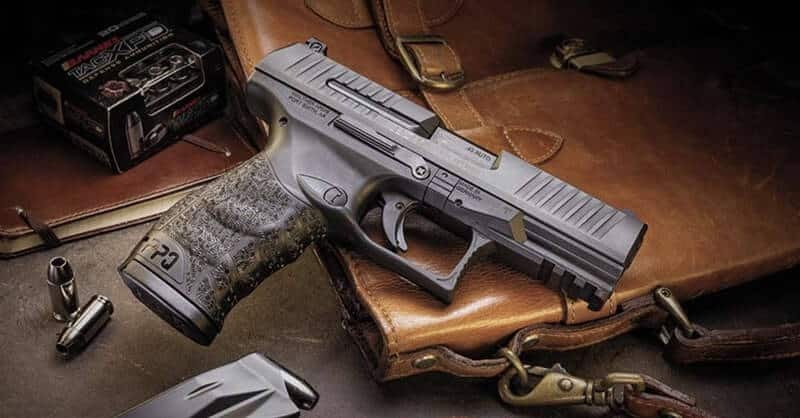 The PPQ 45 also holds 12 rounds of .45 ACP plus one in the magazine, so it offers an impressive amount of firepower as well (as several .45 pistols hold ten or fewer rounds in the magazine). The Springfield XD series of pistols are another popular lineup of handguns like the Glock and the Smith & Wesson M&P. 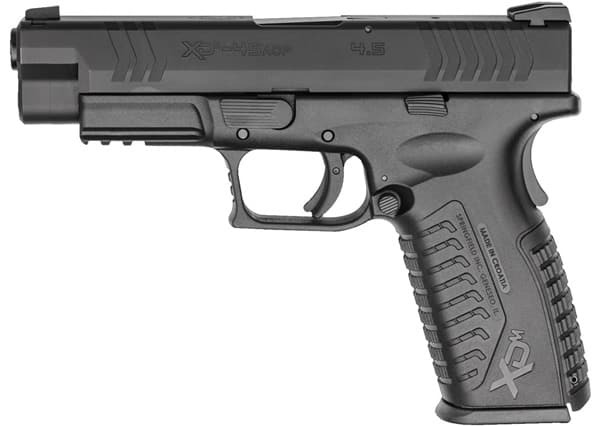 The XDM is a development of the XD. The biggest differences are that, unlike the XD, the XDM features a match grade barrel and interchangeable back straps. Now the first XDM was chambered for .40 S&W. It held sixteen rounds in the magazine. That model was soon followed by the 9mm and then the .45 ACP variant. A competition model with a longer 5.25 inch barrel is available as well. The Match Grade barrel is the big selling point of the XDM over the XD. Why is a Match Grade barrel so important? The answer is because it has been manufactured to have better accuracy and tighter tolerances over standard pistols. While Match Grade barrels are intended for competition use, they can certainly be used for self-defense as well. Additional features of the XDM include an optional manual safety (depending on the model that you choose), a Melonite finish for improved rust and corrosion resistance, Major Grasp Slide Serrations for a superior grip, an ergonomic grip, and a loaded chamber indicator. Additionally, unlike a Glock, you do not have to pull the trigger on the XDM in order to disassemble it, which is something that many shooters will like. Standard capacity on the XDM is an impressive 13 rounds. First of all, out of all of the .45 pistols on this list, the Beretta Px4 Storm .45 has the lowest capacity at 9 rounds with the standard magazine, though it can be extended to ten rounds with a larger magazine. Still, there are a number of impressive features of the Px4 that make it worth looking at. For example, the Px4 in general is a very unique pistol on the market for its rotating barrel design when the slide is pulled back to the rear. This is unlike most other pistols that use a locked breach design and with a tilting barrel. Beretta claims that the rotating barrel of the Px4 helps make it easier to control and more accurate, which can be a major plus especially with the naturally higher recoil of the .45 round. 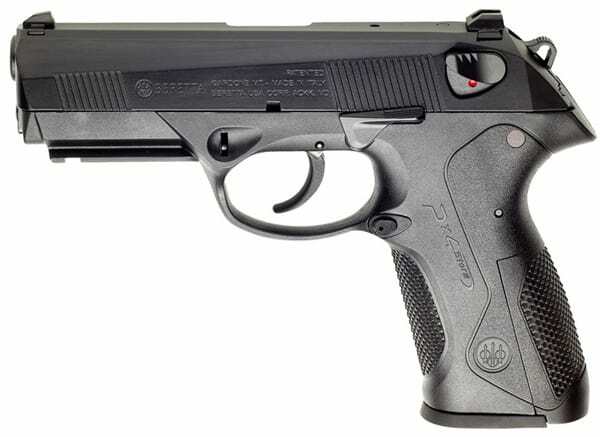 The Px4 is a double action/single action, hammer fired pistol. It features a safety and decocking lever on the side, much like the 92FS/M9. It also features interchangeable back straps, and an ambidextrous magazine release that can be swapped for right handed or left handed shooters. The HK45 is a pistol that was originally developed for the United States military. Back in 2005 to 2006, the military was out looking for a .45 pistol to potentially replace the M9 Beretta 9mm. To this end, they developed the Joint Combat Pistol program, and Heckler & Koch entered the HK45 pistol. 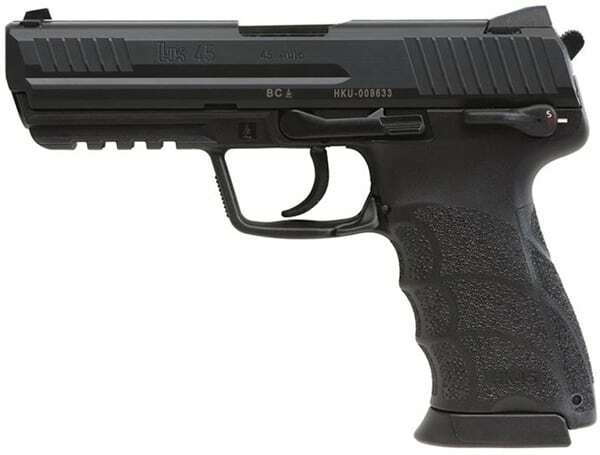 Even though the Joint Combat Program was suspended in 2006, the HK45 still saw much success, being designed as a potential replacement for the HK USP .45. HK also marketed the HK45 to the civilian and law enforcement markets, as well as militaries all around the world. As a development of the USP 45, the HK45 basically took an existing proven design and made a number of upgrades. For example, HK strove to make the HK45 a more ergonomic weapon than the HK45, by using the same grip design and texture of the HK P2000 pistol. As a result, the HK45 has a textured grip with finger grooves, an ambidextrous slide release, and interchangeable back straps. Additionally, the HK45 features a Picatinny rail for mounting lights or lasers, an O-ring polygonal barrel just like the HK USP, and improved grip serrations on both the front and back of the slide. Standard capacity of the HK45 is ten rounds, while the smaller HK45C hold 8 rounds in the magazine. This is admittedly a downgrade of the HK USP, which holds 12 rounds in the magazine. When selecting a .45 ACP pistol, for range use or for home defense, there are a number of very important factors that you will want to look for. Specifically, what is the reputation of the manufacturer? You’ll want to buy a gun from a company that is known for producing quality on a consistent basis, and you’ll be glad to hear that each of the models of .45 pistols we will soon cover come from companies that do exactly that. So long as your gun is going to be used for self-defense, it needs to go BANG every single time you pull the trigger. A reliable gun is an absolute must, and again, each of the five makes and models of .45 pistols we will soon cover has a reputation for reliability. Like we discussed in the last section, the larger your .45 pistol is, the easier it will be too shoot. Larger models of .45 pistols are often soft shooting, but smaller and lighter options can be much more snappy. For this reason, for a defensive pistol, a mid sized to full sized pistol will be a good option. A long, gritty, and/or sloppy trigger pull can be detrimental to a defensive pistol and greatly hinder your ability to fire fast and accurate follow up shots. You’ll want a .45 pistol with a trigger that is smooth with minimal grit and sloppiness, and with a relatively short reset as well. Last but not least, you want a pistol that’s accurate for self-defense. The good news is that you can get an accurate pistol by buying from a reputable manufacturer like we just talked about previously. And while there’s a common misconception that pistols with a tilting barrel design are not accurate, this is simply not true at all. In conclusion, the FNX-45 Tactical, Walther PPQ 45, Springfield XDM, Beretta Px4 Storm, and HK45 represent five of the best .45 ACP pistols on the market today. The .45 is truly a great round for self-defense or even just for casual target shooting. It’s a round that has been around for over one hundred years, and it will most certainly be here over the next hundred as well.